This year WNBull turned 120 years old, a rather significant event for the company. But WNBull is not very effective at describing itself to others. Seeing as I have been looking into the history of the funeral industry I thought it only appropriate to write a post with everything I know about Bulls rich history. WNBull has a rich and interesting history. It has come a long way since it was founded by William Nugent Bull, but this history is difficult to discover. Much of it I found out only by working at the company and later talking with people who interacted with the company. WNBull is very passive when it comes to any advertisements or descriptions. They do not have an 'about' or 'history' page on the website or anywhere else. Amusingly, if you search "WNBull history" on google this blog and a parliament mention of the company are what come up. In 1938 WNBull got it's first motorised hearse. It was the first funeral home in Sydney to use a motorised hearse according to a 1938 Catholic Press advertisement (Involve, 2012). This is at a time when cars were still not common in Sydney. Then in 1940 WNBull developed a device to hermetically seal coffins. Advertisements emphasised the fact that it eliminated risk when the coffin remained in a church or home before the funeral. The wording of the ad is interesting. It talks about "penetration and dampness" as well as "funeral hygiene . Neither of which would be discussed publicly today, let alone be used to describe the benefits of a product (Involve, 2012). WNBull was also progressive when it came to uniforms. Anecdotal evidence indicates it was the first funeral home in Sydney to use white uniforms in summer. Advertisements from the time talk of how these uniforms were specially designed for the Australian climate. White (and other non-black) funeral uniforms have become much more common in recent times. Especially for female funeral homes (such as White Lady Funerals). From what I can find WNBull started this trend back in the 1940s. There is also some evidence to suggest WNBull was the first to use a duel-cab hearse. The duel-cab hearse has become quite common, almost a standard staple of the modern industry. Several people have told me how WNBull set this trend. I can find no solid evidence to support or refute this. Yet several different people have told me the same story. And Given WNBull's progressive attitudes in the past I find myself inclined to believe this. In 1989 WNBull created the 'Bereavement Department', it was the only funeral home to have a councillor on staff full-time. As far as I know it is the only funeral home in Sydney to ever do this. Other funeral homes recommend councillors, they do not have them on staff. However the WNBull councillor supposedly retired in 2012. Although the WNBull website and information still lists him as part of the company. So either they have yet to update as his retirement was quite recent, or he did not retire after all. WNBull changed hands a few times, but most notable was when John harris bought the company in the 1960s. I cannot find the exact date when he bought the company, but it was around the 1960s to 1970s. When he bought WNBull it had been faltering, but within a short time he turned the company around. Then in 2010 he retired, selling WNBull to InvoCare who is the largest funeral company in Australia. InvoCare celebrated the purchase of the company in the August edition of Involve (Involve, 2010). InvoCare proceded to leave WNBull alone for the most part, mainly focusing on improving OH&S and other similar things. The transition to InvoCare was not perfectly smooth. Many disliked InvoCare, so once WNBull became part of InvoCare some began to doubt Bulls. Also a large part of the WNBull identity was built on the fact they were not InvoCare (as is the case with most non-InvoCare funeral companies). This was something they would tell others, but more importantly a big part of how the company and staff defined themselves. To join InvoCare was to lose a foundation for who they were and what they did. The very identity and being of Bulls was brought into question and would need to be reformed. It was no surprise that this change of identity had an impact on business. In the early days of the transition to InvoCare Bulls lost some business. Many argued that it was due to being part of InvoCare, how people don't like InvoCare and liked Bulls as it was independent. But two years later this has faded and WNBull being owned by InvoCare no-longer has a notable negative impact on the company. It was recently discovered and subsequently brought to my attention that WNBull has presented two pictures to the SCG. The first is called the "Medallion Print" which depicts Don Bradman. It has "Sidney Riley Studios" written along the bottom. Just below it is a caption which reads: "Don Bradman/On staff of Mick Simmons LTD., Sydney". The picture has a metal backing and frame, designed so it can be hung on the wall. But most interesting is a lable stuck to the frame stating: "Items presented to the SCG trust by/Mr. Peter Harrington/On behalf of W.N.Bull/Funeral directors/164 King St. Newtown". There are no dates on this picture, just what I have written. I decided to look into Peter Harrington, seeing as this was the only decent bit of information. The most notable thing about Peter Harrington is that he founded the Bereavement Department in 1989. He retired from the company in 2004 (Spruhan, 2009). I can find no other decent information or dates about him. But it leds me to conclude this photo was presented to the SCG sometime between the 1980s and 2004. 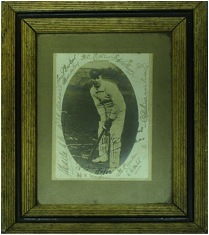 The second image is an autographed picture of Victor Trumper, which you can see below. It has several names signed around the photo, but most are illegible. On verso of the frame is a note which says "From batch marked, items presented to SCG trust by Peter Harrington on behalf of (ILLEGIBLE) funeral directors". The caption ends with "conclusive", whatever that might mean. I suspect Peter Harrington presented several things to the SCG trust, and quite possibly some were mislabelled or misplaced. These photos were my jumping off point for getting more details about the Bereavement Department. Such a unique offer from a funeral home, yet there is little information about it available. Another 1938 Catholic Press ad states that one of the new WNBull hearse's had been fitted specially for Catholic funerals with a beautiful crucifix and Lalique statues. WNBull evidentily focused on Catholic funerals from the start. Joseph Nugent Palmer (the youngest son of William Nugent Bull) attended Catholic schools. First the Marist Brothers' High School then St Josephs College in Hunters Hill. He remained an active part of St Joseph's even after leaving, and was a part of the St Joseph's College Old Boys' Union. he often supported Catholic speakers and heckled socialists at the Domain (Keene, 2005). Catholics in Australia had a strong connection to Spain in 1913. The watched the second republic dismantling of church schools. Joseph Bull decided to defend his faith in Spain. He resigned in July 1937 and went to Spain via the Vatican to enlist in the Spanish Foreign Legion. Joseph Bull was the only Australian to fight for the Spanish nationalists during the Spanish Civil War. The legions hymn "we are the Bridegrooms of Death" was sung each day. This is where he gained the nickname 'Bridegroom of Death' which would stick with him for the rest of his life (Keene, 2005). This is a clear indication of how the family behind the company were devout Catholics. He was the only Australian to go and fight for Spanish nationalists and defend Catholicism. In the 2000s WNBull did the funerals for all but one of the Catholic orders in Sydney. WNBull also did most of the priests funerals, even when it was not through a religious order. This is because of two reasons. Firstly WNBull has a long and respected history with the Catholic society, even since it was first founded in 1892. The second reason is that WNBull does the religious funerals at cost, thinking of it as a service to the Catholic community. However, in recent times this relationship with the Catholic community has waned. I hear rumours that WNBull will not be part of the Catholic funeral group or listed in the Catholic Directory come next year. Whether this is true or not it is a blow for WNBull. While it does not directly lose them business it does question their standing within the Catholic community. That is why just the possibility that WNBull will be excluded from these things is so damaging. For it to be possible means however unlikely WNBull has lost its place in the Catholic community. I must point out, I am not concerned with whether or not this is true and have not made any attempt to verify it. I am simply interested with the idea, with the rumour itself. Because only a few years ago nobody would have even thought a rumour such as this was possible. Yet now a few different people have told me about it, and believed it. So it clearly demonstrates that Bulls has drifted from the Catholic community in recent times. Currently Bulls has a relatively weak link to the Catholic community. A few people I talked with at cemeteries who were Catholic had never heard of the company. Even a few religious members (such as fathers) had relatively little knowledge of Bulls. While working at the company last year two different priests asked me if the manager was still working there, or if the woman in the photos was still there. I have continued to find this lack of knowledge of Bulls as I study the industry. For example, many I talk with think Bulls does not fund or support any community work, Catholic or otherwise. Despite the fact that Bulls is relatively supportive of St Vincent De Paul and other such groups or causes. Many mistakenly believe WNBull was responsible for Mary MacKillop's original funeral in 1909 and subsequent exhumation and move to the current resting place in 1914. WNBull was part of the exhumation, they did have an active role in this (although WNBull makes this difficult to discover). But they were not part of the initial funeral. Another funeral home was responsible for the original funeral, although I find it tricky to work out exactly which funeral home this was. The best source for this information is rather unusual. It is a small display within the chapel at St Joseph Hostel, Hunters Hill. It is a rather good and accurate display, with photos and information. Unfortunately it is the only thing with any real detail on Mary MacKillop's funeral that I can find. I might contact this organisation soon and see if they can share the information with me. This was not a publicised fact, many interested in Bulls might never even have known. There were only three public acknowledgements of this milestone. The most notable was a mention in the State Parliament on the 13th of September. The parliament congratulated Bulls on its 120 years of service to the people of NSW. And that it recognised WNBull as a "truly Australian company that has played a significant part in the history of NSW". This was a rather unique find, disappointingly absent from the Bulls website. The next most notable acknowledgement was from InvoCare in the May edition of Involve, on page 27. It is the most detailed and descriptive thing about the 120 year milestone. This one page article has a history and description of the company. In line with the quality of Involve it is a very good article. Well written, sourced and descriptive. In fact this is the most descriptive thing I can find online about WNBull. The final public thing I know of to celebrate the 120 years is from Bulls. It was an advertisement in the Catholic Weekly. The ad featured a photo of all the staff and said how WNBull had turned 120 and was proud to be continuing its 'tradition of excellence'. I must admit, it was a few months since I saw it and I did not keep a copy. Unfortunately I cannot find it anywhere online, such as in the Catholic Weekly archives. I wouldn't even believe it existed had I not seen it myself. These are the only three places with any notable talk of WNBull turning 120. I found a few 'media release' documents about WNBull escorting the relic in September. These releases do have a short sentence stating that WNBull has been operating for 120 years now. It is a shame that a company with such unique history made so little effort to celebrate this notable moment. InvoCare, the parent company, did more about this than WNBull itself. Even my blog has now publicised and celebrated this more than WNBull. It is a rather special year as InvoCare is still new to owning WNBull. They could have done a joint celebration with InvoCare, their new owners, and the Catholic community, who has supported the company for so long. I find no surprise that Bulls has lost standing with the Catholic community. WNBull turns 120 and does not invite them to the party, or even hold a party for that matter. As someone said, the company could have at least thanked the community who supported it for 120 years. WNBull is a very important part of King St, Newtown. It is almost as old as King St, and has become a part of King St identity in a very subtle way. I have spoken with a few Newtown locals as part of this article. I have friends in the area plus decided to stop a few random people on King St. The people who have lived there for a long time might not be able to name WNBull, but most know of it. Many even know what the building looks like, for them Bulls is part of the King St identity. However, this is changing as people who have moved there recently have no idea about it. I talked with a few people who worked in the area, in local shops. Most had never heard of it or knew about it, and those who do know of it don't know what Bulls does or is like. WNBull has quickly faded from King St's memory. Going from an integral part to an overlooked mystery. A big reason for this is that Bulls does not participate in anything to do with Newtown or King St. Others like TJAndrews often participated in the Blue Moon festival, and even the Newtown festival, but not Bulls. Unfortunately Bulls does not even network with local businesses. I was talking with one shop keeper who told me how there's a regular meeting of small King St businesses. They had invited Bulls several times, but never got a reply. If Bulls left King St tomorrow few would notice and less would care. WNBull is no longer a part of King St or Newtown culture or identity, as far as many locals Bulls might as well be located in North Sydney. Bulls has gone from an important part of the Newtown identity to an unknown and ignored shadow. Many within the industry have told me how Bulls was once a respected company. That they looked up to it and considered it to be a high standard. How if someone worked at Bulls they had a good chance to get anther job within the industry. Unfortunately these people all say how their opinion has changed. At open days and talking with staff here and there, many think Bulls is "not what it use to be" as someone said. Again, like many rumours I do not care if it is true or not. I am interested in the idea behind the rumour, the fact that people now think of Bulls in a negative way compared to before. Two different funeral home managers have said how they would now be hesitant to take an ex-Bulls employee. Whereas in the past they would have been more than happy to have them. I do not know if this believe is spread through the whole industry, but it is certainly present with everyone I have talked with so far. Along with the sources listed below I heavily relied on talking with others to put this post together. Obviously I cannot (and will not) list these discussions as it is a matter of privacy. I also used my time at the company last year to explore or substantiate some information. Involve, 2012, May, issue 25. Involve, 2010, August, issue 20. Keene, J., 2005. Bull, Joseph Nugent Palmer (1908-194). Australian Directory of Biography. Spruhan, T., 2009, Marathon man now cares for the bereaved: A conversation with Richard White, bereavement services director, Catholic Weekly.